Postmenopause can be a tough phase for any woman. With lower hormone levels than ever before, it can be tough for your body to keep up like it used to. Here are a few herbal remedies for the postmenopause stage that can help keep your body healthy. A supplement that has been widely used to treat a variety of illnesses and diseases, black cohosh contains diaphoretic, antipyretic, antifungal, and antibacterial compounds. Each of these help to treat menstrual and rheumatic problems, which are often caused by inflammation and hormone imbalance. Recent studies are claiming that black cohosh doesn't contain estrogen-like chemicals, as was previously thought. Scientists still do not understand exactly how black cohosh works with the body, but it does provide an effect similar to estrogen. Most commonly, black cohosh is used to help women suffering from symptoms related to hormone imbalance, including infertility, irregular periods, and common menopause symptoms. Dong quai is often referred to as the “female herb” because of its long-known benefits for gynecological health. It was used medically in ancient China to help stabilize women's hormone levels. When a woman's hormones are stabilized, it is less likely that she will experience uncomfortable side effects of menopause. Dong quai can also be used to treat blood disorders, working as a mild sedative and anti-anxiety supplement. Ginseng interacts with the body in two specific ways that help combat menopausal symptoms. The first is through a compound called ginsenoside. Ginsenosides can boost stamina and energy, and they are also capable of decreasing memory loss. 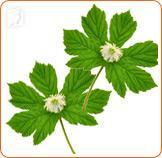 The second way that ginseng interacts with the body is through hormones. Hormones play one of the most important roles during menopause. When you are going through menopause, your body reduces production of vital hormones, resulting in menopause symptoms. Ginseng increases estrogen levels by replacing the body's hormones with plant-based estrogen. Ginseng has been criticized recently because it adds hormones into the body, which some people believe can have serious side effects, such as an increased risk of breast cancer. Macafem is a natural supplement made from an herb that is cultivated in Peru. This supplement improves hormonal function and nourishes a woman's endocrine system, providing relief from menopause symptoms. Click on the following link to learn more about other herbal medicines for postmenopause.